of David, Pointed as they are to be sung or said in Churches. Bound Together with . . .
By Thomas Sternhold, John Hopkins, and Others. Bookseller in Ave-Mary Lane, London 1758. At the present time then we stand with our Bible in one hand, and our Common Prayer in the other. We must cast away neither. Looking at both, indeed, we see the identity of their principles. This is our strong ground. Our Liturgy is drawn from the Scriptures, and we contend, that it may be resolved into them again by the soundest process of argument, and by the most exact tracing of authorities. But, thus extracted from the Scriptures, it is to be for ever maintained, together with them, by all the true sons of the Church. It is the external monument and test of our Establishment; and hence we are bound, in a peculiar degree, to maintain the Book of Common Prayer, and all the doctrines calculated for its support. But by preferring the Bible alone to the Bible and Liturgy united, we return to the imperfect state in which we were before the completion of our Reformation. This road, indeed, is open to Dissenters (p. 75). In his role as parish clerk, Edmund Carey not only was responsible for advocating these two most important books, but also he had to maintain parish records related to church attendance and donations, baptism, marriage, death, deeds, and wills. Most important for young William's upbringing, however, was Edmund's responsibility to serve at the church altar and function as a lector in Sunday church services. In Edmund's role as a lector, William would have heard his father read the King James Version, The Book of Common Prayer, and to lead the choir and congregants in singing and responsorial lessons from The Book of Common Prayer or a common hymnal such as The Whole Book of Psalms. Such order was William Carey's formative religious instruction. In the first fourteen years of my life, I had many advantages of a religious nature, but was wholly unacquainted with the scheme of salvation by Christ. 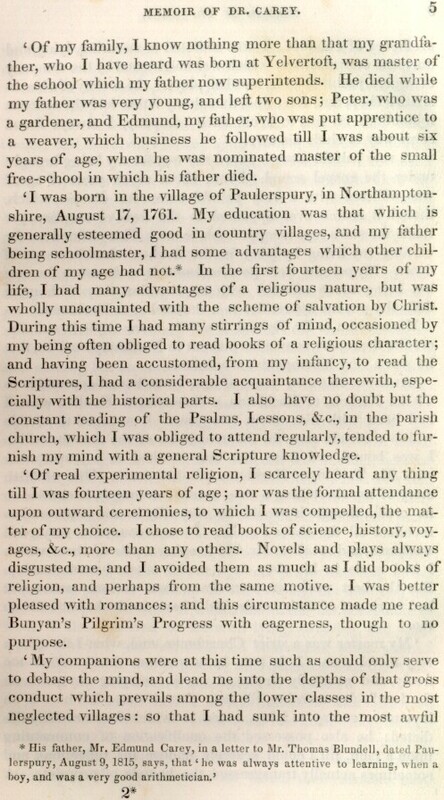 During this time I had many stirrings of mind, occasioned by my being often obliged to read books of a religious character; and having been accustomed, from my infancy, to read the Scriptures, I had a considerable acquaintance therewith, especially with the historical parts. I also have no doubt but the constant reading of the Psalms, Lessons, & c., in the parish church, which I was obliged to attend regularly, tended to furnish my mind with a general Scripture knowledge. The history of The Book of Common Prayer probably began with Thomas Cranmer, Archbishop of Canterbury, 1533-1556. In 1549, Cranmer produced the first Book of Common Prayer. Several revisions to Cranmer's work occurred between 1549 and Carey's early life in Northamptonshire, 1761-1780. 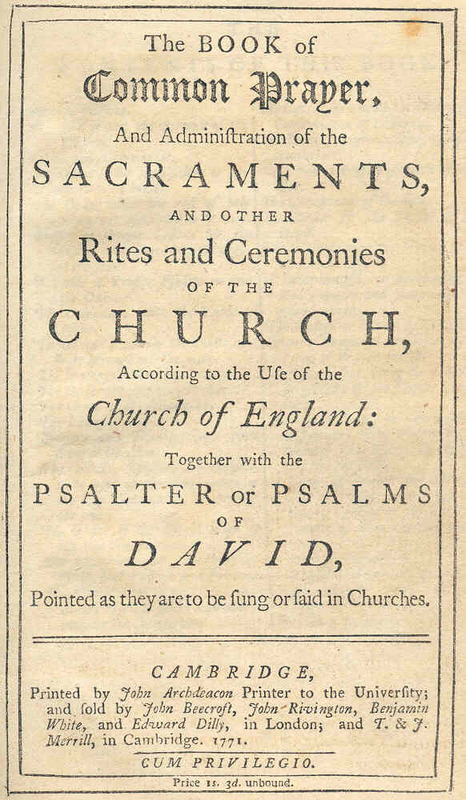 Some significant editions of the Book of Common Prayer include the following editions as presented by the Anglican Society of Archbishop Justus, which maintains an elaborate web page devoted to The Book of Common Prayer. Percy Dearmer. Everyman's History of the Prayer Book. London: A. R. Mowbray & Co., Ltd., 1912. J. H. Benton. The Book of Common Prayer: Its Origins and Growth. Boston: Privately Printed, 1910. William Reed Huntington. A Short History of the Book of Common Prayer. 1893. 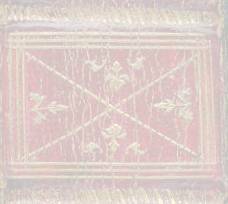 Below are links to the Carey Center's full-text 1771 Cambridge edition of The Book of Common Prayer. Please note that this edition is not paginated in the original copy, and this landscape edition is presented in Adobe format. The Order for the Administration of the Lord's Supper of Holy Communion. The Psalter or Psalms of DAVID, Pointed as they are to be sung or said in Churches. A Form of Prayer and Thanksgiving to Almighty God to be used in all Churches and Chapels within this Realm, every Year, upon the Twenty-fifth day of October; being Day on which His Majesty began his happy Reign. Thomas Sternhold (d. 1549) was a court poet to Henry VIII, and composed about thirty biblical psalms for singing in common meter. Sternhold described himself in Certayne Psalmes (ca. 1549) as "grome of the kynge’s Majesties roobes" (i.e., "groom of the king's Majesty's robes"). Later, John Hopkins added over sixty psalms to Sternhold's work, and by 1573, all 150 psalms had been set into form for singing. 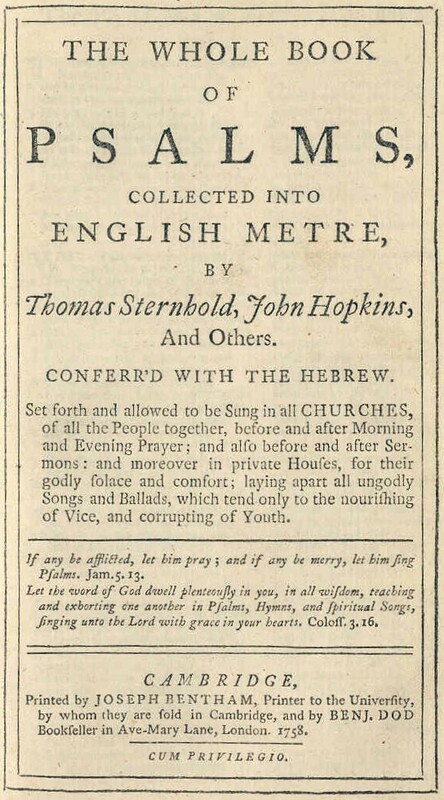 More often than not during the late sixteenth, seventeenth, and eighteenth centuries, Sternhold and Hopkins's work appeared along with The Book of Common Prayer.